Men are not new to jewelry. Since ancient times, jewelry and necklaces are the most common accessories worn by humans. And with the trend, they are exploring it more. Nowadays, necklaces are not only limited to women’s wardrobe. Men also wear them, and these are generally known as neck chains. They are lightweight and easy to carry. You can pair them with your coolest outfits. Men’s neckwear exists in a huge range from patterns to sizes and styles. These are worn not just to add a complement to the outfit but also enhance the masculinity of a man. Here we have listed seven stylish men’s neckwears that are a valuable addition to their wardrobe. Dog tags necklaces were worn by military personnel with their information engraved on it. But, nowadays, they are one of the most popular fashion jewelry in trend. People are wearing it as a piece of fashion jewelry with a message engraved on it. These messages can be customized by the wearer as per their choice. It generally has two tags hung with a single ball chain. Dog tags are usually made of stainless steel, but they can be customized and made of titanium, silver, platinum, and gold. For a change, the fashion industry keeps replacing the tags with texts or an image or a raised design. Even the ball chain can also be replaced with other finer chains or chords. Chains are an evergreen part of a man’s wardrobe. They create different looks depending upon the metal, length of the chain, the method of fastening and most important, type of the links. The most popular link styles for chain necklaces for men are Figaro, rope, bead, box, and Cuban. They are popular due to their design and don’t kink easily. Here we have some designs of Cuban link chains from Frost NYC that are quite popular and in trend. They are usually made of gold. Whereas, if you want a simple look even with formal attire, you can opt for a silver chain. Its length, design, and thickness can be customized as per the wearer’s choice. The only way to wear a chain is to wear it with modesty. Keep your chain under your shirt. Just a hint of it will make a statement for you. Because the metal used in your chain is enough to define the quality and its looks. No matter whatever style or metal you prefer, wear it confidently. 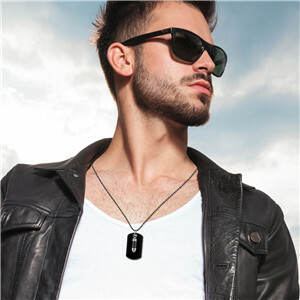 Pendant necklaces are the most popular style preferred by a number of guys. It is just a single small ornament on a long chain or chord. This ornament can be a piece of decoration or jewelry or a charm. Some of the stylish men’s pendant include crosses, dog tags, and tribal-inspired pendants. Along with that, you can choose your pendant’s material from stainless steel or sterling silver to titanium. Pendants that are small work well if you want to wear them on regular days and will not poke your chest. These necklaces go with your casual outfit. Pendant neckwears provide you a personality that chains simply don’t. Additionally, it offers you a more modern overall look. These necklaces are just like pendant necklaces but these are not just for stylish looks. They represent a religious symbol. These are worn for spiritual reasons and for protection from evil. It requires a specific faith. You can find them with a Christian cross, scapular, stars of David and few other symbols. These generally have a long chain and are worn under the clothes below the neckline. Chokers are the necklaces worn near to the neck. They generally don’t hang down to your neckline. They are made up of various materials but the most popular type of choker is hemp. If you are quite fashionable, you can go for rope or leather chokers. There are a few varieties of metal chokers. But they can be combined with rope or beaded designs. These are widely popular in the US, Africa, and England and often chosen by the college guys or the artists. But before buying a choker make sure to measure your neck circumference just to be sure that it is comfortable and will not suffocate you. Beaded necklaces have huge popularity and are in trend when it comes to men’s accessories. You can wear them anytime and with any outfit to have a simple yet charismatic personality. These look amazing when worn with a casual outfit. These necklaces don’t cost you much and come in different designs and colors. They also vary in shapes from short and choker wear to a long string of beads. In addition to these, you can add charms, crystals, pendants, and gemstones to them. There is an option that you can have personalized beaded neckwear. If you are quite creative and want to have a unique piece for you, follow these DIY tips to make one. Most of the men prefer to have a feather necklace made of silver in the form of a pendant. This is the most common accessory worn by men. They add a high style quotient to your appearance and are easy to maintain. There is a vast range of feather necklaces and are not too costly compared to other metals. They are available in different sizes, shapes, and designs. You can wear this to maintain a signature style. These are worn to achieve an artistic and contemporary look. Along with these, it is important for you to coordinate your accessories with your outfit so that it makes a right impression and enhances your overall appearance. When it comes to picking up a necklace, it is best to understand your personality and preferences. Most importantly, keep it simple yet stylish. Whatever you may choose to wear, always look confident about it. Additionally, make sure that it is for the right occasion and carry it with elegance. You should know how to carry your outfit along with making a compliment with your accessory. To read more on topics like this, check out the life & lifestyle category.